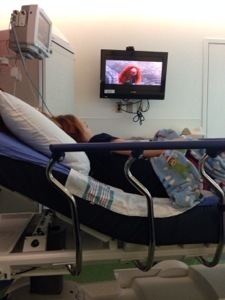 Kaley is Back in the ER - Who Said Nothing in Life is Free? Send some prayers and good vibes this way please !!! Hoping they don’t need to admit her but she is in a lot of pain (or was before they loaded her up on pain meds). We are waiting for them to come get her for a CT scan to see what is going on. In the meantime, we get to watch Disney’s Brave !!! UPDATE: Kaley was admitted for observation. They can’t figure out why she is having pain. All her tests have come back normal which is good but I want to know where the pain is coming from !!! The GI doctor will be here in the morning so we should know more then ! Praying for healing for her. Praying for her and your family!! God Bless!! Same here, thinking on her and your family. Get Well soon Kaley. Nobody should be sick on Christmas. My thoughts and prayers are with you! I pray you are home soon! Praying for healing and strength for your precious daughter and family. Wow, I am so sorry.She was doing great for a long time.Maybe she ate something that disagreed with her.I will pray for her as noone wants there or anyone elses babies to be in pain. You be calm Amy. She will be fine. ok. I am so sorry. Praying for you and Kaley. I was wishing this was all in the past for you guys. Praying for a speedy recovery ! Thoughts and prayers for Kaley. Keeping you all in my prayers…Get well Kaley!! Oh no, sorry to hear she isn’t feeling well. wow, I’m sorry to hear that. was so good to hear no news about her. Hope she feels better and is out quick. hope Kaley feels better real soon. Thoughts and prayers with you Amy. Hurry up and come home Kaley! Said a prayer for healing and dr wisdom for finding answers quickly! With God nothing is impossible. Keeping u and ur family uplifted. Be encoraged and Believe!!!!!!!! Hang in there Mama – I know it’s hard! Hopefully Kaley didn’t get the gardasil shot(see truthaboutgardasil.org). If she did, don’t get the other two rounds. Besides that, don’t get her any unnecessary vaccines. The heavy metals and all the other stuff in it are terrible. Try natural chelation with herbs. Could just google it. nope she didn’t get that shot.